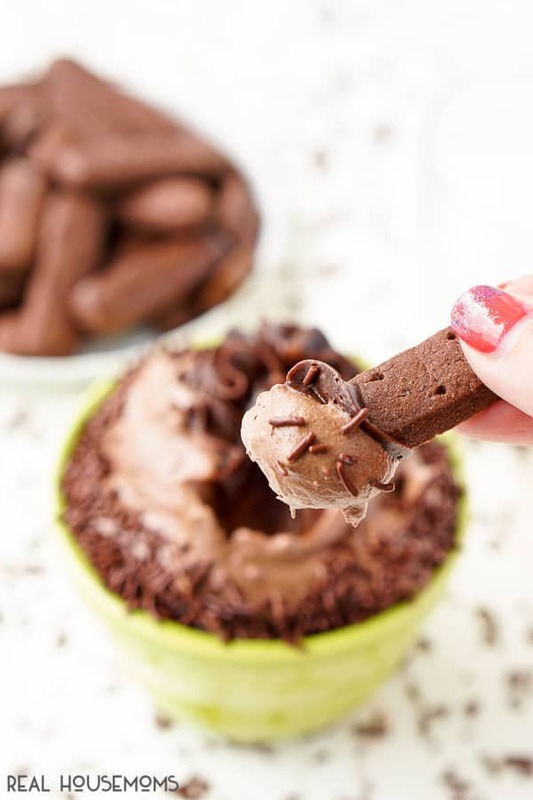 This 4-Ingredient Chocolate Cake Batter Dip is ready in just 5 minutes and is a delicious solution to your chocolate cravings! Love it? Pin it to your DESSERT board to SAVE it! Sometimes late at night, a crave chocolate cake like you wouldn’t believe. It’s bad, like really bad. And no, I’m not pregnant, I just always want some chocolate cake! The funny thing is, right up until college, you couldn’t get me to eat a slice of cake of any flavor, but boy how times have changed. My scale wishes I had continued to hate cake, but cravings can’t be controlled, or, at least, I don’t have the willpower to control mine. But most of the time, I don’t plan ahead and the store is closed and baking an actual cake takes WAAAAYY too long, am I right? 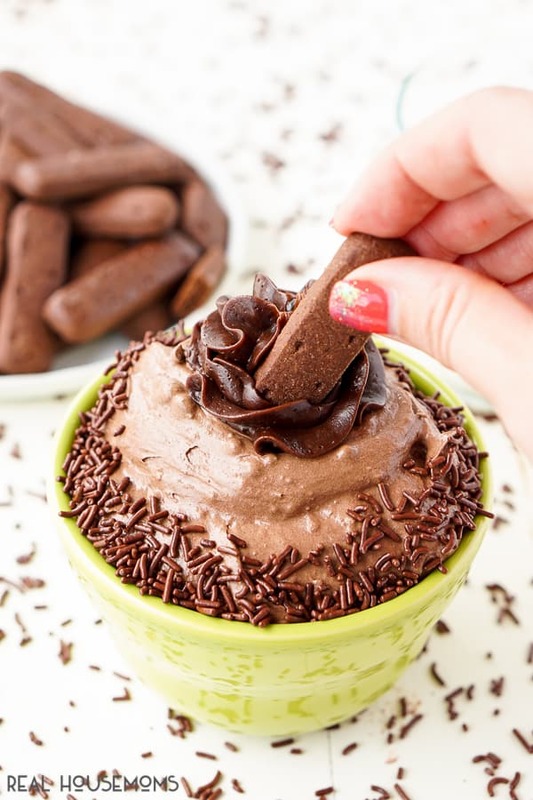 So I created this 4-Ingredient Chocolate Cake Batter Dip! This Chocolate Cake Batter Dip is made with just 4 ingredients that I try to keep on hand at all times so it can come to my rescue when I have a serious chocolate craving. I usually alternated between this dip and my German Chocolate Cake Dip. 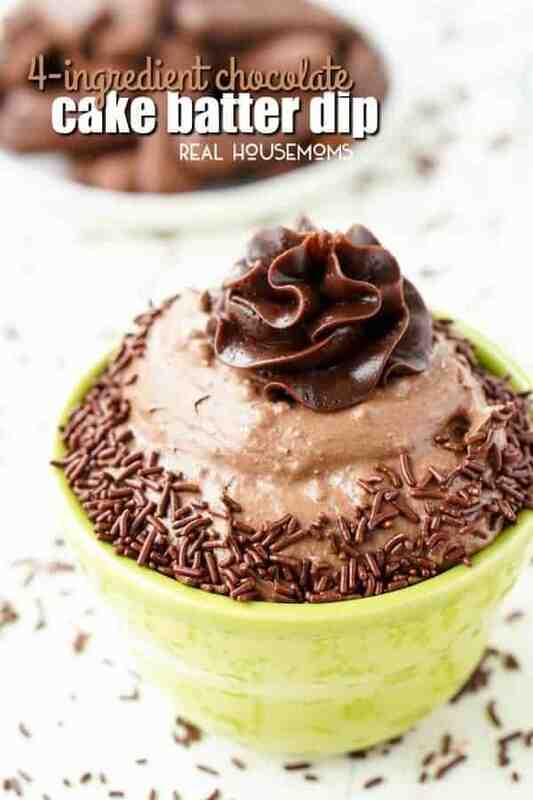 This recipe is made by combining chocolate cake mix, cool whip, chocolate frosting, and SPRINKLES! You can make this dip up ahead of time and serve it with honey or chocolate graham cracker sticks, fruit, or pretzels. It makes a great addition to birthday parties, bridal showers, baby showers, pretty much any gathering really. But it’s also perfect for just a night at home on the couch with a good book or movie! Add Cool Whip, cake mix, and frosting to a medium bowl and beat until combined. Transfer to a serving bowl and top with additional frosting and sprinkles, if desired. Serve with crackers or fruit. I use store bought frosting, but you could use homemade.